That is the question. My ebay shopping sprees have landed me a few accessories that sometimes came with the lenses I purchased. UV filters, Sky 1A warming filters, and a couple of close-up filters. I never gave these filters much thought at all. So when the time came to decide whether they are beneficial or not, I hit the web for answers. Which led me to this highly controversial question. Sky 1A filters are generally used in film to warm up the image. This was typically used on portraits where a warmer skin tone tends to look more pleasing. On digital, this can be achieved with white balance, so having that filter there is pretty useless. Close-up filters are the poor-man’s macro. I got a set of Vivitar No. 1, No. 2 and No. 4 close-up filters, which offers different degrees of magnification. Since I have a dedicated macro lens (which definitely has better performance), I’ve never used these filters either. The controversy lies in UV filters. Back in film days, UV filters were used to absorb ultraviolet light that could affect the exposure. On digital, this is not an issue at all, and the only purpose it serves now is to protect the front element of the lens. But is it effective and is it worth it? 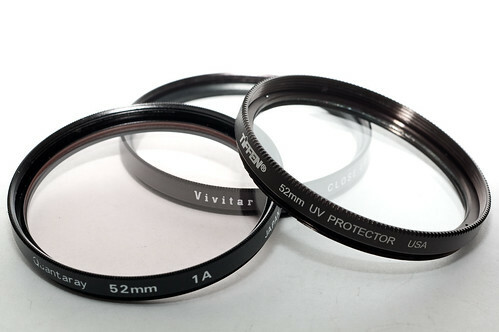 The pro-UV camp has numerous ancedotal evidence of how that UV filter saved the lens from fatal accidents. The idea is that it’s better to shatter the $50 UV filter than to shatter the glass on that $1000+ lens. On the flip side, the anti-UV camp is arguing that if you do have a $1000+ lens, why would you want to put an inferior $50 glass over it? This will certainty lead to a loss of image quality. Cheaper single coated filters especially, can sometimes cause unwanted and strange reflections in the image. The argument also goes on to say that a lens hood provides much better protection from falls and accidents. Personally, when I first started out, I was all set to buy UV filters for all my lenses. They were my babies and I wanted to protect them. I use a hood all the time, but I still wanted that extra layer of protection. But now that I tend to shoot with manual lenses only, I hardly use them anymore. My lenses cost about $30-$40 on average, so buying a $30 filter to protect my $30 lens just didn’t make economical sense. If my lens got damaged, I can take that money I saved from not buying a filter to just buy another lens. That’s a nice benefit of shooting manual focus. And apparently, there are a lot of clumsy people who often drop their lenses. I’ve never had any accidents of dropping my lenses on the ground (knock on wood). I always change lenses close to my bag, and never leave lenses unattended or anywhere in danger of falling. Like I said, they’re my babies. So for me, the answer is easy. I don’t have any expensive equipment to protect, and with some of my pre-AI single coated glass, I need all the image quality I can get. At least this will be one accessory I don’t need in this expensive hobby.